The best air purifiers for pet hair aren’t just great for pet owners – they work well for people with allergies, asthma, and other breathing issues too! We reviewed 10 of the best air purifiers that are built to handle your dog or cat’s hair, dander, and odors to keep the air you breathe clean, safe, and smelling great. Before you buy an air purifier for pet hair, here are a few features you should know about first. Let’s get started! 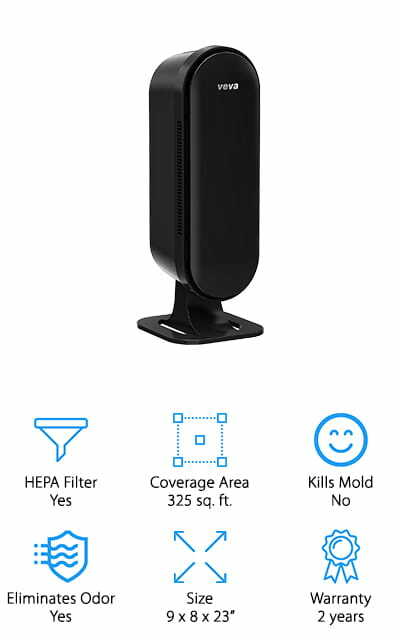 HEPA Filter: A high-efficiency particulate air (HEPA) filter is built to a specific standard to pull 99.97% of small particles from your home’s air. This means it will eliminate common household irritants, while also pulling pet dander out of the air too! 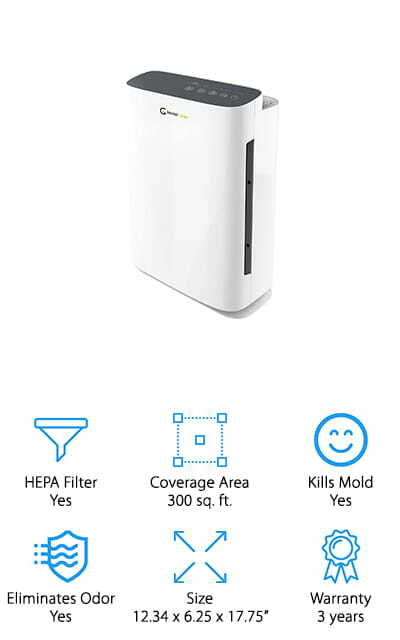 Coverage Area: To make sure you get the right air purifier for the size of your space, we noted the coverage area (in square feet) for each option. This can help you find a machine that is efficient and within your budget. 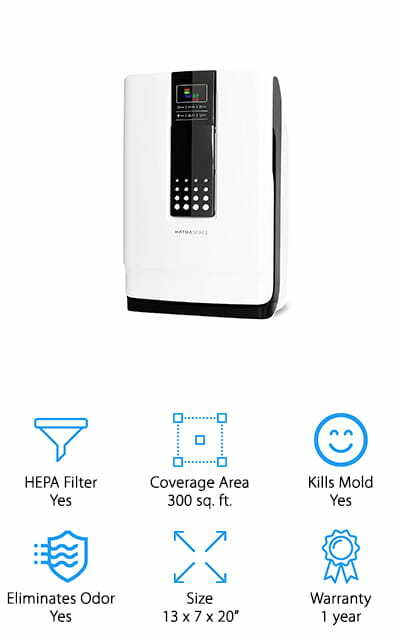 Kills Mold: In addition to trapping mold in the HEPA filter, some purifiers use ultraviolet light to kill mold. The UV light also helps kill dust mites, viruses, bacteria, and other small particles to keep you and your pets safe and healthy! Eliminates Odor: Many of the air purifiers we reviewed also have extra filters and features to eliminate odors. This is great if you want to get rid of odors like that pesky “wet dog” smell, the cat’s litter box, or your gerbil’s cage! Size: We also noted the size of each purifier, so you can find one to fit your space. Small units are great for bedrooms and small apartments. Many of them are also designed to blend into your home’s existing décor, too! Warranty: A warranty is a good sign that the air purifier you’re buying is a quality machine from a reputable company. It means they will fix or replace your machine if it malfunctions or breaks within a certain number of years. Now that you have a better idea of what kind of air purifier you need, let’s get into the reviews! If you need an air purifier for cats, dogs, or seasonal allergies, we found several that work great to keep your air clean all year round! If you are short on time, that’s okay! Just start off by reading about our Top Pick and Budget Pick now, and then come back later to read about the other 8 amazing options! Our pick for the best air purifier for pet hair goes to this powerful and efficient air purifier from Winix! It uses a 5-stage filtration system to thoroughly clean the air in your home, making it better for pets and those with pet allergies. The pre-filter is washable and works hard to trap large particles like pet hair, preventing them from clogging the machine. 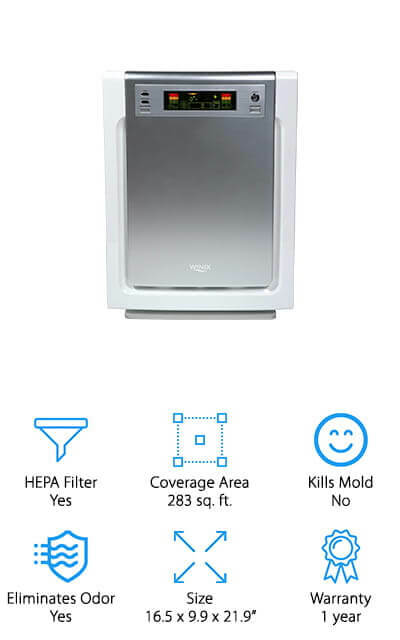 The HEPA filter and anti-bacterial treatment grab smaller particles like pet dander and dust. We also like the extra carbon filter that reduces common pet odors from the air! Their PlasmaWave layer kills bacteria, dust mites, and other harmful particles to keep your air cleaner. It also makes cleaning the machine easier – no worries about exposure to mold while you clean! You can run this machine on a variety of settings manually or from a remote control, making it easy to switch settings without getting up from your seat! Next up is our favorite for the best pet air purifier if you’re on a budget! This compact air purifier is great for small spaces like bedrooms and small apartments. The unit itself is small, and you can use it standing upright or on its side. This gives you the option to fit it under a table or on a bookshelf! It uses a permanent HEPA filter and pre-filter that you vacuum regularly to keep clean, which saves you tons of money over time! No need to buy expensive replacement filters! We also like that this machine helps to eliminate pet odors, so you don’t have to deal with the smell of a wet dog or litter box! It has 3 speed settings, and it’s super quiet so it won’t disturb you or your pets while you’re trying to sleep! We think this is the best air purifier for pet dander if you want to save money without sacrificing performance! Are you looking for the best air purifier for pet allergies? This air purifier from GermGuardian works hard to make sure the air you breathe is safe, clean, and smells great! The pre-filter traps large particles like dog and cat hair, which helps your machine run more smoothly over time by keeping big pieces out of finer filters. The HEPA filter grabs pet dander of all kinds, which is the major cause of pet-related allergies. Finally, the UV-C light actually kills airborne particles like dander, influenza, mold spores, and even pneumonia! For people with allergies, this is great for protecting your from irritants, and it makes cleaning your purifier much safer! This is also a great air purifier for pet odors, thanks to the charcoal layer on the pre-filter, neutralizing odors from pets, cooking, smoke, and more! We like this air purifier so much that it was also our Top Pick for the best UV air purifier for the home! Another great air purifier for dogs, cats, and other furry pets is this set from VEVA. It comes with a high-performance air purifier, HEPA filter, and an extra set of 4 pre-filters. This is enough to keep your machine running smoothly for a year, which is great if you’re on a budget. It covers up to 325 square feet, which is perfect for medium to large rooms in your home, like a living room, basement, or den! The pre-filters eliminate odors and trap large pieces like pet hair to keep your machine running smoothly. The 3 speed settings give you the option to run it on low to reduce noise and for everyday use, or crank it up to high for times when you need the extra help removing pet dander and odors! If you are concerned about ozone levels in the air, don’t worry – this machine is ozone-free to keep you and your pets safe from harmful ozone vapor. For a pet hair air filter that looks just as good as it works, grab one of these beautiful and highly efficient air purifiers from Blue Pure! This air purifier for cat hair, dog hair, and other everyday allergens uses a washable cloth pre-filter that fits over the machine’s base. You can buy them in several fun colors to match your décor, including blue, pink, yellow, black, and more! The design is modern, sleek, and fits easily into small spaces like dorm rooms, bedrooms, and offices. Oh, and it works amazingly well, too! It has a fine-particle filter to trap pet hair and dander to keep your air clean and reduce allergens, and it also has a carbon filter that helps eliminate offensive odors like smoke, chemical cleaners, cooking smells, and pet odors. It’s also environmentally friendly, too! All of the filters are recyclable, and it uses less energy to run, which reduces your carbon footprint and your energy bills! Next up is the best air purifier for pet odors and dander that won’t keep you up at night! This air purifier from Oregon Scientific is perfect for keeping in your bedroom to reduce pet hair, dander, and odors while you sleep. The 4-sided air intake grabs more air quickly to keep the air in your room clean and smelling great. 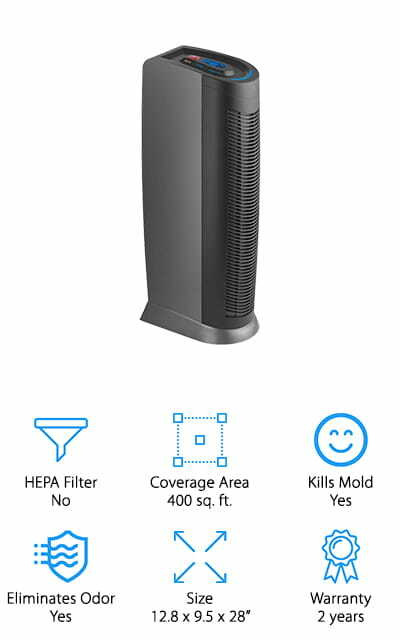 The HEPA filter removes fine particles from the air like pet dander, dust, mold spores, and smoke that create odor problems. The activated charcoal filter also helps to neutralize odors in your home from pets, cooking, smoke, and chemical vapor. It also has an optional UV light setting to kill bacteria and viruses during cold and flu season. We also like that this machine is super quiet! On the low setting, it only emits 32 decibels of noise, which is roughly the equivalent of whispering. We think this would be great in a child’s bedroom or quiet office space! Another of our favorites for the best air purifier for cat dander and other pet odors is this compact purifier from Envion. This small unit works up to 200 square feet, and it’s great for bedrooms, bathrooms, and your college dorm room! We like that this small purifier fits into small rooms without taking up useful space – it fits well on a side table, in a corner, or under your bedside table. It also comes in 6 bright and punchy colors, so you can choose one that blends in or stands out! 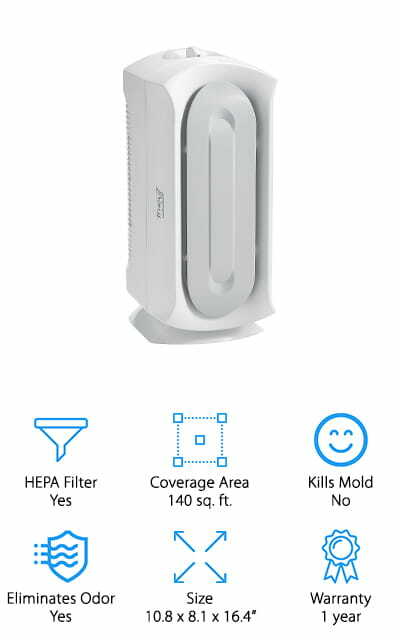 The permanent, HEPA-style filter grabs small particles like pet dander, pollen, and dust to keep the air safe and reduce allergy symptoms. Instead of buying a new filter every few months, just vacuum it out to keep it clean and in working order! The germicidal light kills bacteria, dust mites, and mold spores to keep you and your pets safe and happy. A great idea for small spaces! If you want a dog and cat hair air filter for the larger rooms in your home, this air purifier from InvisiClean is a great option! This model can clean rooms up to 300 square feet, so it’s great for small apartments, living rooms, basements, and any other large space you want to keep clean. We like the sleek, modern design, which blends into any décor style. The motor is powerful, yet energy-efficient motor pulls in a lot of air to help clean particles and odors from the room quickly. We like that you can set it on a 2-8 hour timer, including a “sleep mode” that turns off the bright lights so you can sleep easy. 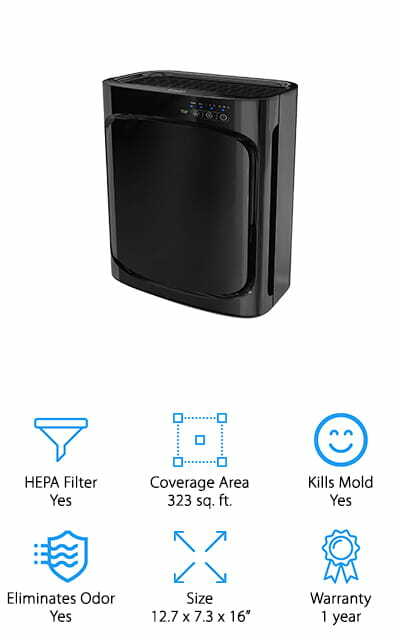 It has a HEPA filter to trap small particles and allergens from the air, and a charcoal pre-filter that kills odors from your pets, or other common household odors. The UV light destroys harmful particles like viruses, bacteria, mold spores, and pet dander. 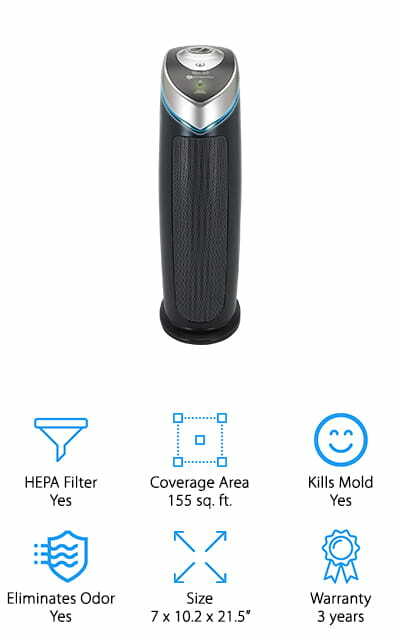 If you want to invest in the best performance air filter for your home, this purifier from Hathaspace is a great air purifier for dog smell and other pet dander issues! This unit uses a 6-stage air filtration system to grab pollutants, allergens, and airborne illnesses from the air. The nano-cold catalyst filter grabs large particles like dog hair and pulls chemicals like ammonia and formaldehyde from the air. Next, the carbon filter neutralizes smoke, odors, and VOCs (volatile organic compounds) from the air to keep it smelling great. The HEPA filter, antibacterial filter, and UV light all trap tiny particles like dust, bacteria, viruses, pet dander, and kill them to keep you and your pets safe. If you need a cat and dog hair air filter that works well for people with allergies, asthma, or other breathing problems, this is a high-powered purifier that keeps your air safe and healthy to breathe, even if you have pets. Last up in our reviews is this great air purifier for pet hair removal from Hoover – a trusted name in home appliances since 1908. This air purifier pulls pet hair out of the air and traps it into the washable pre-filter. The titanium dioxide front screen and UV light technology work together to kill germs like bacteria, mold spores, and viruses so your air stays clean and safe. 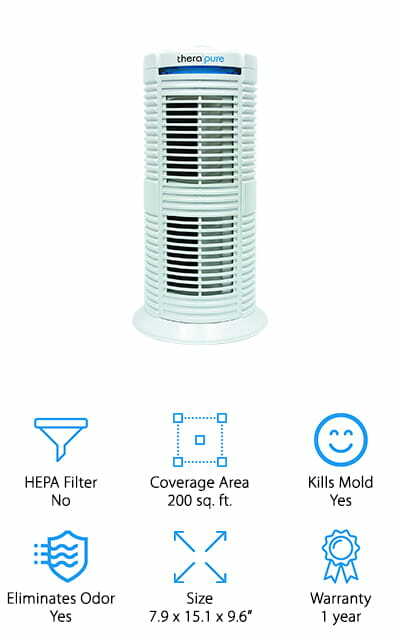 The main filter is made of HEPA-like material that grabs small particles and keeps them out of your air. The charcoal filter neutralizes offensive odors from pet dander, smoke, cooking, and more. 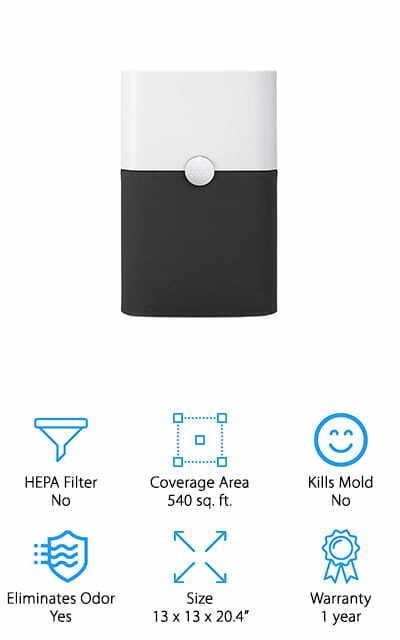 This purifier can be controlled by remote, and you can customize it to just clean particles from the air, or turn on the UV/ion setting during cold and flu season. We also like that it has indicators to tell you when the filters need to be cleaned or replaced, so you can ensure your machine is performing at its best!